In the first installation of its kind, Dialight Corporation’s new LED-based SafeSite illumination fixture has been successfully retrofitted on a drilling rig of a major oil and natural gas producer, providing improved safety and decreased maintenance and energy costs. SafeSite is designed to operate in the harsh and hazardous environments found on drilling rigs, where vibration is the major cause of failure for traditional light sources. 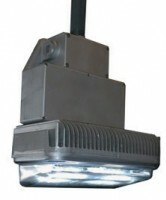 The SafeSite fixture has a very robust housing designed to UL Class 1 Div. 2 standards, and since the LED light source is a solid-state device it is virtually impervious to shock and vibration, making expensive re-lamping costs a thing of the past.